Its Election Day! Its now or never! You may have got this yesterday...but it was meant for today. You said YOU wanted to make a difference? Well the time is NOW... GOGOP needs you TODAY! It's Election Day! Remember to Vote. And take some friends with you. You can find your polling location HERE. You can find a list of our candidates of choice HERE. Remember to Vote NO on proposals 1,2, and 3. If you can afford the time, we still need some volunteers to fill in a few precincts to hand out poll cards. Please let Ross Ensign know by if you can spare an hour or two. Call or text him at 248-613-5821. Please, we truly need your vote and your help to keep the Trump Agenda moving in the right direction! 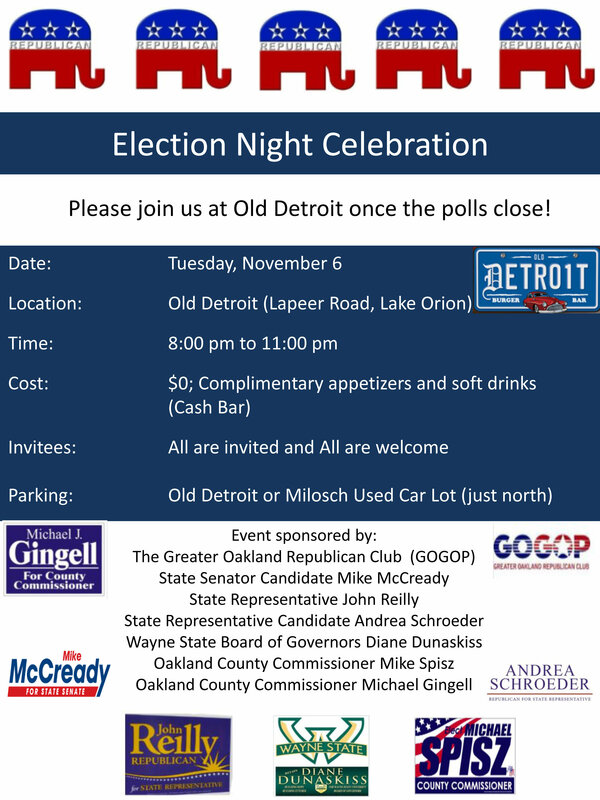 Then join us at the Old Detroit Bar & Grille on Lapeer in Orion when the polls close at 8:00. With no rest for the weary, it's a leadership meeting on Wednesday, Nov 7 at 7:00 pm. We are planning for next year because its right around the corner. If you have a topic that you want us to address in 2019, please come with info or suggestions. If you are unable to attend, but still want us to discuss something of importance to you, email Mari-Ann Henry those suggestions. THIS IS YOUR CLUB. Let's tackle the issues you want to hear about. Tuesday, Nov 13. GOGOP General Meeting. Kings Court Castle at Canterbury. 7:00pm. It's the incredible Professor David Dulio to do an election wrap up! You will not want to miss this! Thursday, Nov 22. Thanksgiving. Give thanks for all the many blessings in our lives. Tuesday, Dec 4. Leadership Meeting at Al Hassinger's. 7:00pm. Tuesday, Dec 11. CHRISTMAS PARTY AT THE ORION KNIGHTS OF COLUMBUS! Bring a dish to pass and an unwrapped gift for our 2nd annual donation to the LION"S A Basket for Everyone. Look for details to follow. Tuesday, Dec 25. MERRY CHRISTMAS TO ONE AND ALL!